.5 x 2"; Black and White print. 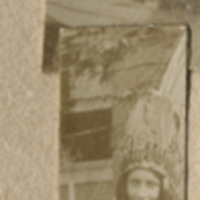 “2, Unknown cut-out image of a student in an approximation of Native American costume.” Florence Anderson Scrapbook. WCSU Archives, 10 Oct. 2018. Accessed on the Web: 19 Apr. 2019.